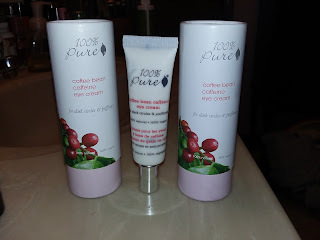 I was organizing my products draw and realized I needed to do another post about my love for the 100% Pure Organic Coffee Bean Caffeine Eye Cream. I've been using it twice a day for over 5 years now and can't do without out. I actually ran out a few months ago and my under eyes were miserable. I knew the cream was luxurious and felt good on my skin but I hadn't realized how much my eyes really needed it. After a co-worker asked if I was feeling well (eye puffiness and tired look), I threw my hands up and was fortunate to catch the cream on sale. I stocked up. Below are 3 of the 4 Coffee Bean Eye Creams I purchased from the 100% Pure website (on sale!). I average about one tube a quarter, so this stash will hopefully do me for the rest of the year. When this product first came out, they were in a glass pump bottle. Cut to me scraping the inside with a eye shadow brush handle to get the remaining product out. I am very happy that 100% Pure has changed to squeeze tubes for most of their products. If you have never tried this product, the cream is very rich and smooth. You just need to use a dab under your eyes. I sometimes apply twice if my under eye area is feeling tight or dry. The difference is immediate. It vaguely smells like coffee but other than that, no perfumes or funky scents. I totally support cruelty free organic skin care products for all the ladies.This coffee bean eye cream is a organic cream that's why I am going to get my hands on it anytime soon.